Get $10 credit when you create a new account at DigitalOcean! PHP 7 is here!!! …well, almost. As of the writing of this post, we’ve reached the 7th Release Candidate (!) phase, so it shouldn’t be too much longer until a stable release is made official. With reports of between 25% and 70% speed improvements, all of us PHP devs should be very excited about this. I hadn’t had a chance to play with PHP 7 yet, and I’m also about to launch a new project (no announcements yet! ), so I figured I would take advantage of the opportunity to learn some new stuff, and maybe give back to the community from which I’ve taken so much. Happy Thanksgiving to the PHP/Laravel community! I followed many wonderful tutorials in the process. I’ll point to many of them here, and summarize any places that I deviated from what those other incredibly smart people did. This configuration should add some protection for SSH, Nginx, PHP, and MariaDB (MySQL) from brute force and DDOS attacks. Note that you have to manually stop and restart fail2ban after you update your jails.local file, and that it will fail to start if you don’t have the correct path to each of the log files listed above. Which will set the schedule to update everything daily, and remove unnecessary files once a week. Sweet! Let’s move on to PHP 7. This is not a bad option. It gives you fine-grained control of the configuration and you’ll have a much better understanding of how it all fits together. BUT, it also means that you have to install all of the many dependencies yourself, and figure out the configuration script, and it is not super easy to upgrade later. For ease of installation and maintenance, this is the easier option, and the one I went with. Fortunately, as we’ll see, there was an easy way to do this. I used the PHP 7 install instructions from Zend along with Bjørn Johansen’s excellent tutorial to install PHP 7 with FPM. Since we’re going to be using Nginx, you’ll want to ignore the instructions for getting it to work with Apache. Since this is a production server, I set the php_flag[display_errors] to “off”. You can set any other directives here that you would normally find in php.ini. Make sure you follow the rest of the step’s in Bjørn’s tutorial VERY CAREFULLY. Whenever he gives you a link for downloading code, I recommend that you use it, rather than running the mistake of mistyping it. Then try it out! If it’s working, you should get output like mine. Which I guess I could have set in the /usr/local/php7/php-fpm.d/www.conf file above. This directive will be important for getting PHP7/Nginx/Laravel to play nice with each other. Next we’ll get PHP 7 working with Nginx. Note that the root directive should point to the directory we just set up. Also the server_name can either point to your domain name (if you’ve associated it with your IP address) or should be set to the IP address of your DigitalOcean droplet, which you can find from your account settings in the DigitalOcean website. Then point your web browser to http://your_ip_address and with any luck you’ll see the default PHP server configuration page. Woohoo!! That’s about it. You may want to follow DigitalOcean’s tutorial How To Secure MySQL and MariaDB Databases in a Linux VPS for more details. You should now be ready to support your Laravel 5.1 app. Also, I said earlier that I originally wanted to use Postgresql instead of MariaDB for this project. The main reason that I didn’t do this is that the Postgres drivers for PHP did not come installed by default on the PHP 7 package I got from Zend. It would probably not be too hard to recompile PHP and include the appropriate drivers, but in this case, it was more trouble to me than it was worth. Also, I found that the build-essential package was already installed by the time I got to this point. Don’t know if it was on there from the start, but I didn’t need to install it. DigitalOcean’s tutorial for installing Redis was spot on. And if you’ve followed everything carefully up to this point, you should be ready for the final step. At this point, you may want to take a snapshot of your server image so that you have a base image for installing further Laravel droplets at DigitalOcean. 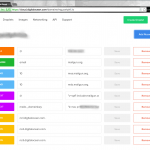 Mailgun recommends that you use a subdomain when you set up their service. I’ll get to that in a moment. 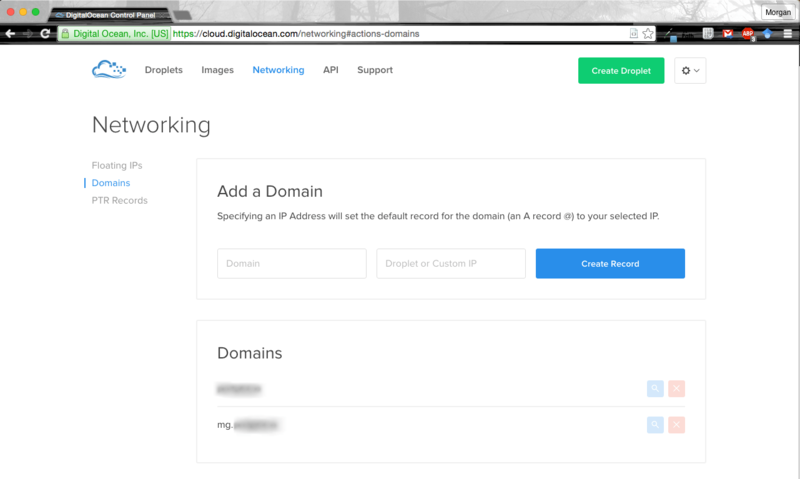 First, to associate your domain with your DigitalOcean droplet, you should follow their tutorial How To Set Up a Host Name with DigitalOcean. When I did that, I was able to get to my main site in a browser, just fine. 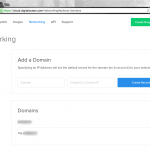 The trick came when setting up DNS for getting verified on Mailgun. As I found out, I am not the only person who has had trouble with this. I tried various combinations of the settings in the forum I linked to, to no avail. Finally, it dawned on me that I might need to set up a second DNS record at DigitalOcean for this to work. This proved to be the solution. Here are some screenshots with sensitive info blurred out. Note that the IP address you associate with your mail subdomain is the one provided by Mailgun and NOT the IP address associated with your DigitalOcean droplet. This step confused me greatly and took me a while to figure out. So I’m assuming that you have your Laravel site in a git repo somewhere such as Github, GitLab, or Bitbucket. I think the only thing that may be slightly tricky here is making sure that the www-data user has access to all of the files and directories it needs to display your site. $ sudo chown -R :www-data . And voila! Your site should be up and live!!! Go check it out! Overall, I’m amazed at how smoothly this whole process went. If I knew what I was doing, I probably could have completed this entire setup in an hour or two. As it was, it only took me about half a day. Not only that, but it was cheap! DigitalOcean only charges $5/month for their lowest price servers, which is more than enough for my current needs (click here to get a $10 credit when you sign up for a new account at DigitalOcean). 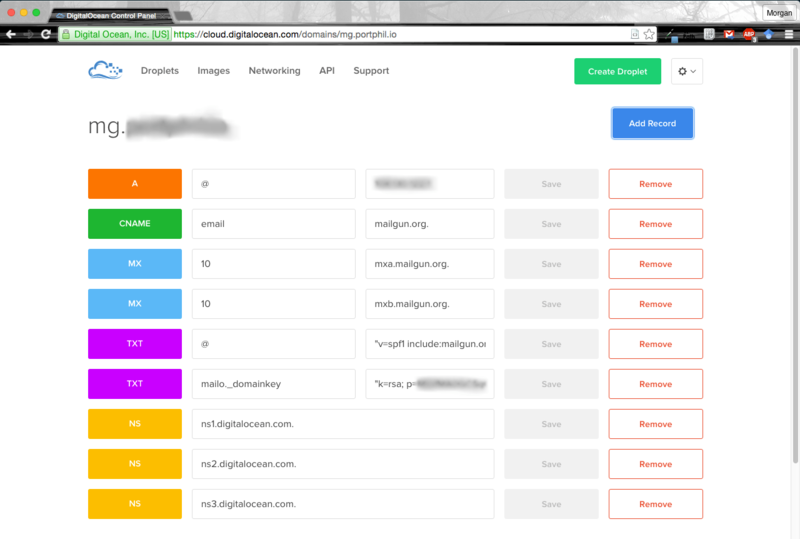 Mailgun is free if you send/receive fewer than 10,000 emails per month and it saves you the trouble of setting up your own SMTP server, hosting email, and all that nonsense. In my next post, I’m going to demonstrate how to set up a push-to-deploy system like what you would find at Laravel Forge or Envoyer. 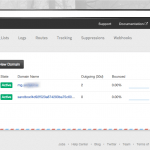 With this setup, your live site will be automatically updated whenever you push changes to your git server. Between that and Ubuntu’s automatic upgrades, it will make for a live production server with very little overhead in terms of maintenance. Stay tuned!